Yeah, but: I'm still not such a fan of the spelling. 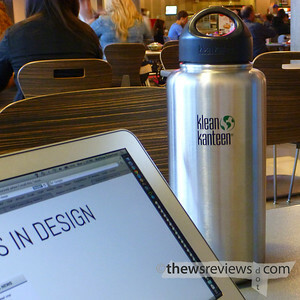 The Long Version: Metal water bottles are nothing new, and Kleen Kanteen has been in the business for a while. At last count my household owns eight of them, and the standard and insulated designs have already been the subjects of reviews. So I'll make this quick. 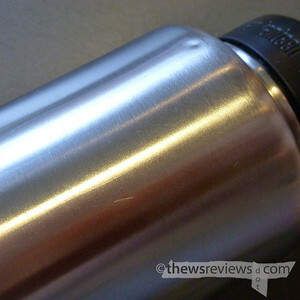 The latest addition to my Kleen Kanteen collection is the 40oz Wide Mouth bottle. Its signature design is spacious enough to let it fit ice-cubes through sideways, which is a great benefit, but one that's tempered by having a thin lip that's not quite as nice to drink from as the rolled top of the standard design. It's also worth noting that despite the prominent 40oz markings – 1182ml – the actual capacity that I measured is almost 200ml more than that. As always, the steel doesn't change the taste of the water, and it's very nicely made. While all big bottles have the same diameter, I find the 40oz size is right at the limit of what I can comfortably hold with my average-sized hands. This bottle recently had a misadventure. When I was last at the Leslie Street Spit I knocked the half-full Kanteen over, and it fell almost four feet onto broken concrete slabs and then skittered across a couple of fairly ugly rocks. While this treatment would probably have chipped the paint on one of their coloured bottles, the plain steel made it through with just a small dent and a couple of scratches. The plastic cap also took a gouge, but it's so minor that it barely serves to distinguish it from my other wide-mouth lid. I wouldn't endorse mistreating one, but I have no doubt that it can take a fair bit of abuse. Just don't put it in the freezer and forget about it.